Based in Fort Myers, and serving throughout southwest Florida, the law firm of Rubinstein & Holz, offers knowledgeable and effective assistance in all family law disputes. Our attorneys have more than 75 years of combined experience in the field. We are consistently listed among Florida's Super Lawyers, Best Lawyers in America, and U.S. News & World Report's Best Law Firms. Two of our lawyers are board certified as "Family Law Specialists" by the Florida Bar: Rana Holz has been certified for more than 10 years, while Alan Rubinstein has been certified for more than 30 years. Both also hold AV Preeminent ratings from Martindale-Hubbell, signifying that their peers have ranked them at the highest level of professional excellence. In addition, Mr. Rubinstein is Lee County's only member of the American Academy of Matrimonial Lawyers — a prestigious national organization of family law practitioners. Our firm emphasizes personal and professional representation. We try to negotiate a settlement before resorting to litigation. However, drawing on our years of experience, we are ready to represent our clients in court when that is what the case demands. Family law matters impact every aspect of the lives of those involved. There are significant considerations regarding a couple's finances and children. Rubinstein & Holz handle complex and complicated divorce and family law matters, and we do so with discretion, integrity and compassion. Our firm is experienced in all areas of domestic relations, including equitable distribution, the distribution of complex assets, alimony, child support and time sharing, parenting plans, relocation, paternity, post-judgment modification, prenuptial and post-nuptial agreements, and related appeals. We work with forensic accountants in valuing business concerns as premarital and marital matters. We believe that family law cases are of the utmost importance and we work to help our clients move forward in their lives. 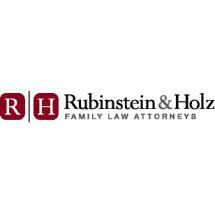 Rubinstein & Holz offers personalized, customized legal services that our clients expect and deserve.